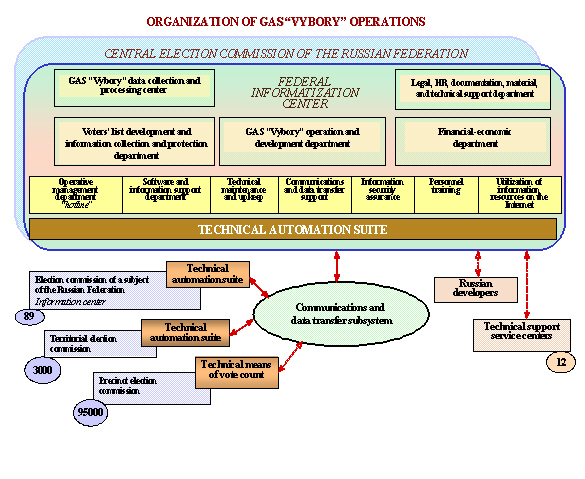 GAS “Vybory” is a federal automated information system that operates on the territory of the Russian Federation and is used to automate information processes in preparation and conduct of elections and referenda, including provision of support to operations of election and referendum commissions, as well as solution of problems that are not related to elections and referenda. The status, designation, structure, contents, legal base, and principles of operation and development of GAS “Vybory”, the order of its funding, as well as the authorities of election commissions and the Federal Informatization Center operating under the Central Election Commission of Russia are accounted for by Federal Law No.20-FZ of January 10, 2003 “On the State Automated System of the Russian Federation “Vybory”. The primary requirements with respect to the contents, volume, order of exchange and presentation of the GAS “Vybory” information resources are accounted for by the following federal laws: “On basic guarantees of electoral rights and the right of citizens of the Russian Federation to participate in a referendum”, “On election of the President of the Russian Federation”, “On election of deputies of the State Duma of the Federal Assembly of the Russian Federation”, and others. Where not regulated by federal laws, the order of operation, utilization, and development of GAS “Vybory” is regulated by normative acts of the Central Election Commission of the Russian Federation. Those are documents adopted by the CEC of Russia that provide for the norms (provisions, instructions, regulations, etc.) regulating the order of operation and application of GAS “Vybory” in preparation and conduct of elections. GAS “Vybory” may include technical means used by precinct election commissions – automated ballot processing suites. Electronic (sensory) voting suites are currently undergoing testing and certification. GAS “Vybory” is a geographically distributed information system that ensures collection, processing, and exchange of data among technical automation suites (TAS) established practically in all of the country’s administrative-territorial division units. GAS “Vybory” is serviced by more than three thousand system administrators who work at information centers under election commissions of the RF subjects that operate in each district center of the country. The Federal Informatization Center under the Central Election Commission of the Russian Federation is responsible for provision of organizational, informational, and methodological support to GAS “Vybory” operations. Technical automation suites of territorial election commissions (TEC) are the backbone of GAS “Vybory”. Territorial election commissions coordinate operations of precinct election commissions. There are 2,738 territorial election commissions and 95,000 precinct election commissions. GAS “Vybory” transmits information collected at the municipal level to 89 subjects of the Russian Federation (regional level) and on to the CEC of Russia (federal level). Its functional structure is flexible and can be easily rearranged depending on tasks at hand in elections held in single-seat electoral districts (e.g., elections to the State Duma) when an additional segment represented by 186 district TAS is made operable. TAS of the election commissions of the subjects of the Russian Federation (regional level) are built on the basis of a local computer network with automated workstations and are able to support databases of up to 0.5 terabytes (up to several million voters). The technical automation suite of the CEC of Russia consists of automated workstations combined into a multi-server local network. The volume of data that this complex is able to support amounts up to 10 terabytes. GAS “Vybory” includes a technical automation suite of the CEC of Russia (678 automated workstations), 89 TAS of the election commissions of the subjects of the Russian Federation (890 automated workstations), 186 TAS of district election commissions (372 automated workstations), 2,737 TAS of territorial election commissions (5,611 automated workstations). 2,100 automated ballot processing suites (ABPS) are used by precinct election commissions. All of the automated workstations are equipped with hardware and software suites that ensure information security. All technical automation suites are combined into a single information environment through a communications and data transfer subsystem. All of the automated workstations are equipped with basic general and special software suites, share a common operational environment and a common database management system (DMS). This ensures homogeneity of the operational environment and complete compatibility of all system elements and TAS levels. GAS “Vybory” and its fragments are used in preparation and conduct of elections and referenda of the federal, regional, and municipal levels. At the stage of preparation for elections and referenda (90-110 days before voting), 31 principal technological processes are automated within the system and (or) its fragments. Two principal technological processes (voting and voting results) are automated at the stage of elections and referenda (1-2 days). At the final stage (10 - 15 days after the voting day) one technological process (determination of voting results) is automated. Upon the whole, one election (referendum) campaign lasts for 100 — 130 days during which a total of 34 technological processes is automated within GAS “Vybory”, of which 91% are used at the stage of preparation, 6% - at the stage of voting, and 3% - at the stage of determination of voting results. In 2004, GAS “Vybory” was used in six federal election campaigns (election of the RF President, 5 repeat elections of deputies of the State Duma), 122 regional election campaigns, and 1,358 election campaigns held at the municipal level. In 2005, GAS “Vybory” was used in four federal election campaigns (repeat elections of deputies of the State Duma), 90 regional election campaigns, and 2,500 election campaigns held at the municipal level. Prior to 2006, GAS “Vybory” ensured implementation of all automated technological processes at least in 36 election and referendum campaigns. Now that elections are held twice a year (second Sunday of March and second Sunday of October – as a backup), and the number of municipalities in Russia as a result of the administrative reform has grown up to 25,000, the workload to be handled by the system will grow dramatically. For example, in March of 2006 (on the common voting day), GAS “Vybory” was used in four federal election campaigns, 39 regional election campaigns, and 860 election campaigns held at the municipal level, and in October of 2006 (the backup common voting day) – in two federal election campaigns, 29 regional election campaigns, and 412 election campaigns held at the municipal level. TAS of GAS “Vybory” are used on a daily basis to enter, process, and verify personal data against available data on voters and referendum participants, as well as to accomplish a variety of administrative tasks. The TAS operated by the CEC of Russia is equipped with a software and hardware suite that supports the voters’ and referendum participants’ registry subsystem that enabled the CEC of Russia to put together a federal database of voters’ data. The database of the voters’ registry of the federal level contains information about 112 million citizens of the Russian Federation, including 107 million voters. 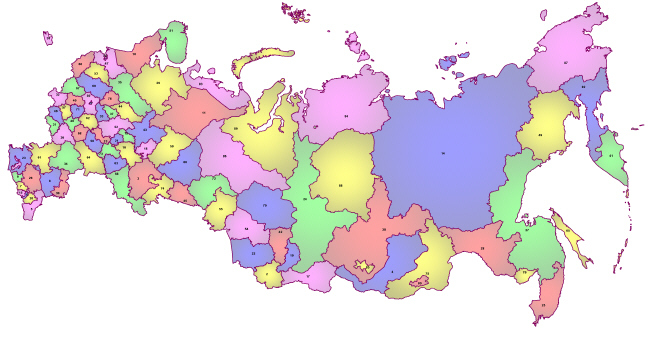 This database can accommodate information on 150 million Russian citizens. A similar subsystem of the regional level on average contains information about 95% of voters of an RF subject. Date the document was issued. Pursuant to Federal Law No.113-FZ of August 20, 2004 “On jury members of general jurisdiction courts in the Russian Federation”, in the solution of tasks unrelated to elections, voters’ data contained in GAS “Vybory” are used to put together lists of candidates for the jury. The complex of interconnected data collection, processing, storage, protection, and presentation technologies implemented in GAS “Vybory”, as well as its integrated database, ensure solution of heterogeneous automation tasks within a common information environment. Said technologies implement norms of election laws using special software. Modification of laws (not only election-related ones) requires modification of the technologies and the special software. Special software (SS) automates labor-intensive technological processes of preparation and conduct of election (referendum) campaigns. The total SS volume exceeds 900 MB. • Financial control over political parties subsystem (FCPPS). Each technological process employs several subsystems. 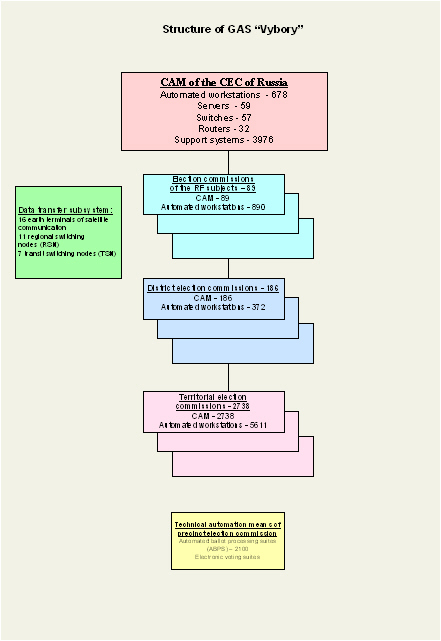 Each subsystem consists of software suites. Each software suite includes several programs used to solve functional tasks. A total of 800 interconnected and regulated (in compliance with legal norms) functional tasks were developed for and are employed by GAS “Vybory”. The information security assurance subsystem ensures comprehensive protection of data as they are automatically processed and transmitted via communication channels. Protection of GAS “Vybory” Internet resources from deliberate and accidental distortion. Automated ballot processing suites (ABPS) integrated into the GAS “Vybory” network have been used in a number of elections in some Russian regions. This type of electronic voting is designed to facilitate automated tabulation of voters’ ballots in elections and referenda of all levels in compliance with the current legislation, accumulation of ballots cast by voters, printing of the final protocol of precinct election commissions, receipt of initial data and transmission of final protocols via telecommunication channels to upper-level election commissions in compliance with an approved format. ABPS ensures simultaneous conduct of elections of seven types and issuance of separate voting results protocols for each one of them. Application of ABPS ensures clear formalization of the voting procedure and objectivity of vote count by reducing the impact of the human factor. The device is simple in its construction and is user-friendly. 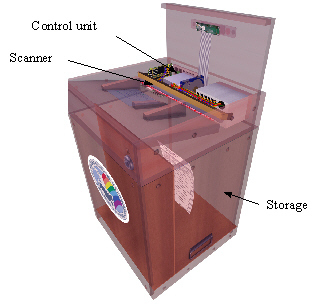 The ABPS consists of a scanner, ballots storage, and a number of peripheral devices: a printer, a modem, and a concentrator.At polling stations, ABPS are operated by two operators assigned from among the members of the precinct election commission with deciding vote. ABPS have passed a series of tests to which they were submitted by an interdepartmental trial board, as well as state certification. The order of application of ABPS is regulated by Federal Law “On basic guarantees of electoral rights and the right of citizens of the Russian Federation to participate in a referendum” and Instructions on application of technical means of vote count - automated ballot processing suites (ABPS) in the course of voting in elections, a referendum in a subject of the Russian Federation, approved by a resolution of the CEC of Russia. In 2004 – 2006, automated ballot processing suites were successfully used for voting in federal, regional and municipal elections in 10 subjects of the Russian Federation: Moscow (four times), St. Petersburg, Tula (twice), Volgograd (twice), Arkhangelsk region, Bryansk (twice), Rostov region, Republic of Adygea, Novgorod region, and Saratov. The feedback provided by members of election commissions, voters, and observers was only positive. To ensure reliability and accuracy of vote count results, by decision of precinct election commissions, manual tabulation of ballots was resorted to at 47 polling stations (Arkhangelsk region – twice, Volgograd – four times, Moscow – 13 times, Tula – eight times, St. Petersburg – five times, Rostov region – five times, and Republic of Adygea – 10 times). Results of manual tabulation of ballots either entirely coincided with results of automated tabulation or differed from them within a legally allowed range. In the course of repeat elections of deputies of the State Duma of the federal Assembly of the Russian Federation of fourth convocation in Preobrazhensky single-seat electoral district No.199 and Universitetsky single-seat electoral district No.201 of the city of Moscow, as well as election of deputies of the Moscow City Duma of fourth convocation on December 4, 2005, in compliance with a resolution of the CEC of Russia, controlling (manual) tabulation of ballots was held at nine polling stations determined by drawing, in order to verify reliable operation of ABPS. As a result of the manual vote count, none of the participating polling stations was required to draw up repeat protocols: the data either entirely coincided with the data provided by automated vote count, or discrepancies fell within ranges allowed by law. Defectively printed ballots resulting in the fact that ABPS automatically reads deficiencies within ballot’s squares and classifies them as voters’ marks. For as long as the ABPS have been used, not a single fact of unauthorized access to data stored therein has been registered. Information is reliably protected by hardware and software means, as well as organizational measures. Upon the whole, in 2004 – 2006, ABPS were used at 3,338 polling stations. On average, each of these devices has been used 5.25 times. This is a great indicator of their utilization. At the same time, it should be noted that each suggestion or recommendation provided by voters, members of precinct and other election commissions, and observers are regularly summarized, analyzed, and decided and acted upon in the form of software and constructive improvements of ABPS. The device becomes more user-friendly, more reliable and fast and its ballot recognition ability keeps improving. 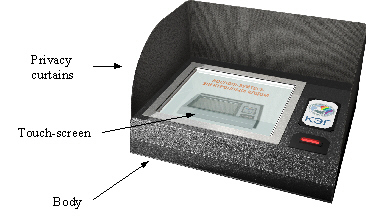 In 2005 – 2006, pre-production models of electronic voting suites were developed to be used to facilitate automatic vote count at polling stations. These electronic voting suites can be stationary touch-screen units and portable units for voting outside polling stations. Pursuant to decisions of the CEC of Russia, on October 8, 2006, electronic voting suites were used in the election of deputies of the Novgorod regional Duma at five polling stations of Novgorod-the-Great. Voting using electronic voting suites is safe and reliable. They ensure secrecy of the ballot, protection of processed data from unauthorized access and distortion in the course and upon completion of voting. Utilization of GAS “Vybory” combined with highly professional performance of election commissions helps improve the trust of most of the Russian citizens and international observers with respect to the Russian electoral system. Development of electronic voting suites was commissioned by the CEC of Russia in compliance with the requirements of the Russian legislation, State Standards of Russia, and electronic voting recommendations of the Council of Europe. The general order of electronic voting and utilization of electronic voting suites in elections and referenda is determined in Federal Law “On basic guarantees of electoral rights and the right of citizens of the Russian Federation to participate in a referendum”. Five pre-production models of electronic voting suites (EVS) were manufactured and tested on the trial stand of the Chief Designer in 2005. Considering the significant public and political importance of electronic voting suites, the CEC of Russia decided to test EVS in the presence of leading technical specialists in the sphere of information technologies and representatives of political parties. To that end, the Chairman of the Central Election Commission of the Russian Federation issued a directive to put together an Interdepartmental Commission. It was comprised of representatives of the CEC of Russia, Federation Council and the State Duma, the RF Ministry of Information and Communications, the Federal Agency for Information Technologies, the Federal Service for Technical and Export Control, the Russian Academy of Sciences, the Federal Informatization Center, the federal state unitary enterprise “Science and research institute “Voskhod”, and some others. Additionally, representatives of the following nine political parties were invited to participate in the project in the capacity of experts: “United Russia”, “Party of LIFE”, LDPR, CPRF, SPS, “Yabloko”, “Agrarian Party”, “Popular Party”, and “Motherland”. In November of 2005, the Interdepartmental Commission organized and held a trial of a preproduction batch of electronic voting suites at seven institutions of tertiary education of Russia. More than five and a half thousand people took part in the trial voting. Trial voting participants were surveyed on account of their opinions about the electronic voting suites and they showed a great deal of interest and positive attitude with respect to the new technologies. The test results demonstrated that the pre-production models of electronic voting devices are technically ready to be experimentally used in the conditions of real elections. At the initiative of the election commission of the Novgorod region, the CEC of Russia decided to experimentally use EVS in the election of deputies of the Novgorod regional Duma at five polling stations of Novgorod-the-Great on October 8, 2006. Each of the designated polling stations was equipped with five touch-screen voting devices and two portable electronic voting devices for voting outside the polling stations. Two training devices for electronic voting were installed directly in front of the voting premises. Additionally, these polling stations were supplied with posters containing the electronic voting rules, and equipped with plasma panels that demonstrated a slide show describing the order of voter’s actions when using an electronic voting device. This approach to organization of electronic voting enabled each voter to practically master his or her actions required for voting using electronic voting suites. This approach facilitated the voting process inside the polling stations. According to voters, they were greatly assisted by an information sheet distributed by the district election commission that described the electronic voting rules. This information sheet was dropped in the mailboxes of all the voters from the five election precincts together with invitations to take part in the election. The voters who had carefully read the sheet used the electronic voting suites with confidence even without preliminary training on training devices. Chairmen of the five precinct election commissions, their deputies, as well as secretaries and two EVS operators designated from among members of each of the five precinct election commissions also underwent preliminary training on how to conduct electronic voting. This training enabled each of the five precinct election commissions to conduct electronic voting with confidence at a great organizational level. No equipment failures were registered which proved the EVS were reliable. Legal organizational documents on the order of conduct of electronic voting and utilization of EVS adopted by the CEC of Russia were tested in practice. Their comprehensiveness and sufficiency ensured professional performance of the precinct election commissions in preparation and conduct of the election using EVS. In the overwhelming majority of cases, people representing various age groups managed to use electronic voting devices successfully and provided their positive feedback. On average, a voter used up to 45 seconds to vote. In some cases elderly people (80 years of age and older) spent up to five minutes to vote. On average, 10-15 such cases occurred per polling station. The election in Novgorod-the-Great was observed by representatives of the State Duma, the Russian Academy of Sciences, political parties and electoral associations, as well as foreign observers (from Great Britain, Germany, Austria, Hungary, and Ukraine) who provided their highly positive feedback with respect to the performance of the members of the precinct election commissions, EVS operators, as well as the performance of the electronic voting suites, their operational reliability, user-friendliness, and fast delivery of voting results. All observers were given the opportunity to freely exercise public control over the course of voting. None of them expressed any complaints concerning the performance of the precinct election commissions and operation of the EVS, nor did they express any mistrust with respect to reliability of the vote count and determination of voting results. At the same time, all participants of the election process: voters, members of the precinct election commissions, and observers provided suggestions and recommendations on how to improve organization of electronic voting and the electronic voting suites. Implementation of these recommendations will help improve public trust with respect to technical means of vote count; each voter will be given the opportunity to visually ascertain the choice he or she made, on paper. The first electronic voting in Russia has confirmed that the path was chosen correctly. Activities designed to improve electronic voting suites, reliability of their operation, reliability of results, transparency of procedures, simplicity of actions required of voters and members of precinct election commissions will continue.